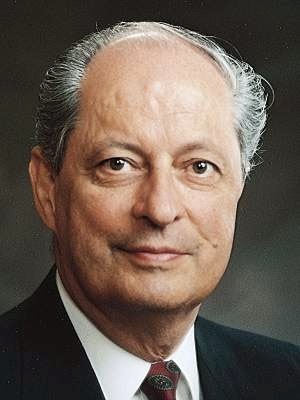 Elder Robert D. Hales (born August 24, 1932) served as a Seventy from 1976 to 1985, when he was called as a member of the Quorum of Twelve Apostles. "Conversion requires consecrating our lives to caring for and serving others who need our help and to sharing our gifts and talents. 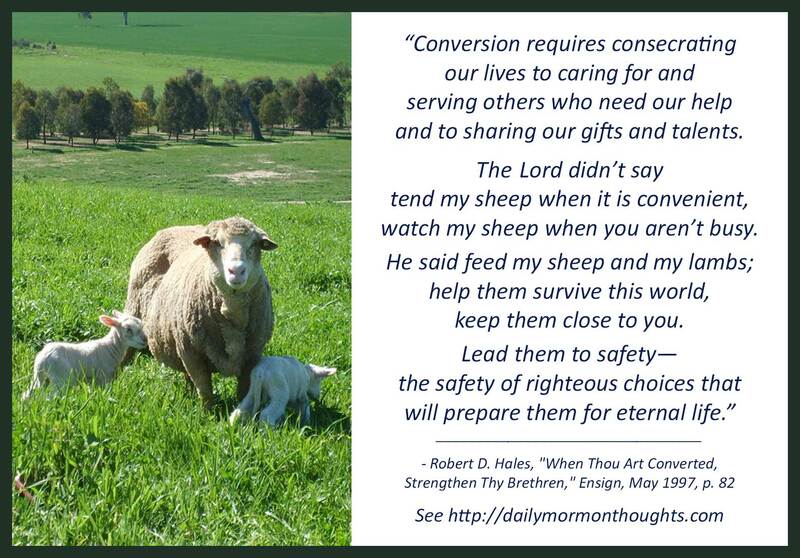 The Lord didn't say tend my sheep when it is convenient, watch my sheep when you aren't busy. He said feed my sheep and my lambs; help them survive this world, keep them close to you. Lead them to safety—the safety of righteous choices that will prepare them for eternal life." Gaining a testimony and growing towards conversion are key steps in our spiritual progress in this life. A key part of the discipleship that accompanies conversion, according to Elder Hales, is the commitment to serve God by serving others. 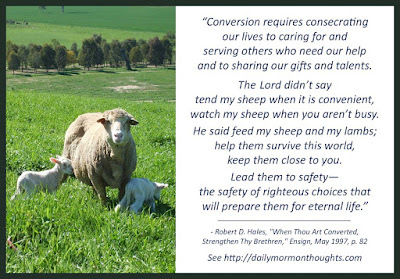 Those who are converted "consecrate" their lives to service of others. The word "consecrate" means to make sacred, and truly a life is made sacred through service. The service of a converted soul is sincere, unselfish, and sacrificing. We don't serve only when it's convenient. We strive always to help one another "survive this world" and prepare for a better one. Ultimately, the only way our own soul can truly progress is to bring others along that path towards eternal life.